Born and raised throughout the greater Los Angeles area, now residing in Oakland, Robert Lopez is a percussionist working in an array of ensembles which span the various facets of experimental music including contemporary composition, free improvisation, and into pop and rock. He holds a Bachelor's of Music Degree in Music Performance from the Bob Cole Conservatory at Cal State Long Beach. There he studied mallet and multiple percussion with Dr. Michael Carney and Dr. Dave Gerhart, hand percussion with Brad Dutz, Ghanaian Ewe drumming with Neili Sutker and Eric Hartwell and drum set with Randy Drake. At the university he performed in various ensembles including the World Percussion Group (which played folkloric music of Brazil and West Africa), the Steel Drum Orchestra, the Percussion Ensemble and the University Orchestra. Outside of his degree work in Long Beach he recorded and performed with rock bands Wild Pack of Canaries, Bobby Blunders, New Lights By Dead Vines and the Vespertines. He also holds a Master of Fine Arts Degree in Music Performance with an emphasis in improvisation from Mills College where he studied contemporary percussion with William Winant, improvisation with Fred Frith, Roscoe Mitchell, and Zeena Parkins and Ewe drumming with C.K. Ladzekpo. Since graduating, his time has been spent making music with bands Opera Wolf, Quattour Elephantis, ZE BIB! and Jordan Glenn's Mindless Thing. Recent and upcoming achievements include the premier of "Work Around the World" by Aaron Gervais for Other Minds Festival 18, a slot at the 12th Annual Outsound New Music Summit Festival with Opera Wolf, a premier performance of "My Frustration of You Elevates to This" by Moe! 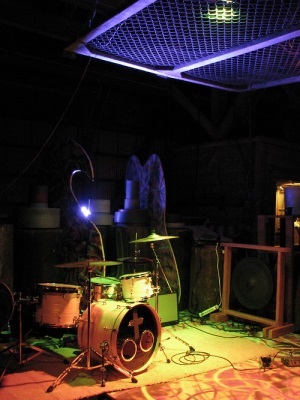 Staiano at the14th Annual San Francisco Electronic Music Festival and a performance by Grex at the 2014 Switchboard Music Festival which follows the recording and release of their full-length album Monster Music. Currently, he is on staff at UC Berkeley, Mills College, and the Oberlin Dance Collective in San Francisco as a dance accompanist and teaches private percussion lessons out of his studio in Emeryville, CA.